India is suffering from the worst water crisis in its history, with 600 million people facing acute water shortage, a government think-tank says. The crisis is only going to get worse. By 2030, the country’s water demand is projected to be twice the available supply, implying severe water scarcity for hundreds of millions of people and an eventual 6 per cent loss in the country’s GDP. 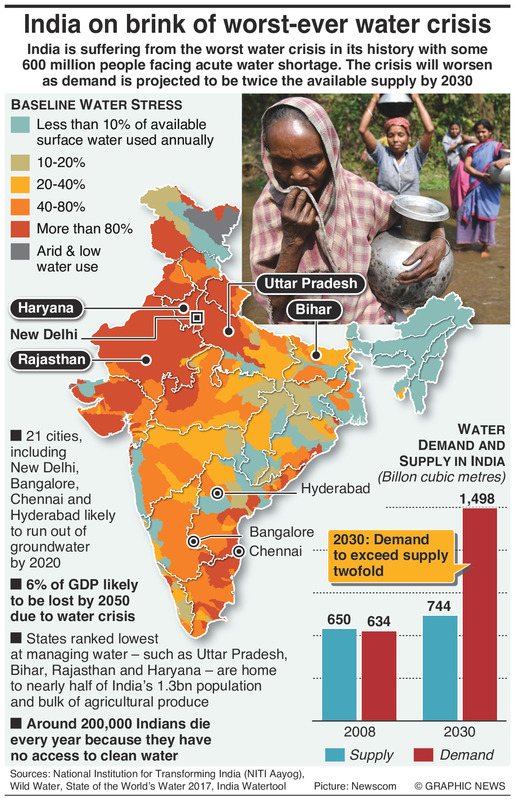 21 Indian cities, including New Delhi, Bangalore, Chennai and Hyderabad, are likely to run out of groundwater by 2020. States ranked lowest at managing water – such as Uttar Pradesh, Bihar, Rajasthan and Haryana – are home to nearly half of India’s 1.3bn population, as well the bulk of its agricultural produce. Around 200,000 Indians die every year because they have no access to clean water.